After a brief talk with Tsumugu, Manaka returns home and meets Hikari. In the occasion, Hikari reaffirms his feelings for her and she claims that have something important to tell him after the Ofunehiki. On the day of the ceremony, the rest of Shioshihsio is about to hibernate when Hikari and his friends help in the fishermen take Akari to the sea god as planned when Iroko lights the way for them. Suddenly, the boats are surrouded by whirlpools and both Akari and Tsumugu fall at the sea and are pulled down. While Chisaki and Kaname dive to rescue Tsumugu, Manaka rescues Akari and decides to offer herself instead. Hikari rescues his sister but fails to save Manaka as well. Meanwhile the boat carrying Kaname, Chisaki and Tsumugu makes a fast maneuver to avoid a pillar falling onto them, but Kaname falls in the occasion and his fate is uncertain, while a strange barrier covers the entire Shioshishio. #2 - The Color of the Sea. The Color of the Earth. The Color of the Wind. The Color of Your Heart. Your Color. In order to save Manaka, Miuna is swallowed up by the whirpool that Ojoshi-sama made and is covered in Ena that wraps around her like a cocoon. Hikari and Tsumugu go to save her but are held back by the powers of a god. Chisaki rejects Tsumugu and flees back to the surface. 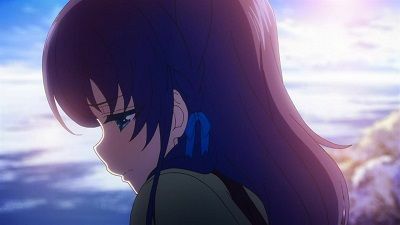 Returning home, she meets Kaname, who realizes that she is indeed in love with Tsumugu and encourages her to be honest with her feelings, but she claims that by doing so would betray the feelings she had for Hikari all this time. Later at night, Akira shows to Manaka a letter in which he declares that he loves her and she can't shake the sadness of not being able to remember what love is. In the following day, Chisaki asks Isamu how the story of the Ojoshi ends and he reveals that the Ojoshi did not reunite with her lover as he died by drowning in the sea while attempting to chase after her. Meanwhile, Tsumugu drags Hikari and Kaname to meet Uroko and reveals that when his Ena awakened, he felt the feelings of several being surrounding him and certain that Manaka's feelings are mixed between them, he has the idea of holding another Ofunehiki, using Manaka's stone as part of the Ojoshi doll representing her feelings in an attempt to please the sea god and return Manaka's true feelings to her. Much to their surprise, Uroko agrees with his plan and the residents, including Hikari and the others' old classmates from the past, gather to make preparations for it. When Chisaki reveals her intentions to become the Ojoshi for the festival, Tsumugu reprimands her for it, and Kaname overhears them. Realizing that, Sayu chases after Kaname and lashes at him for not being honest with his true feelings and confessing her own feelings for him in the occasion. Moved by her words, Kaname thanks her and claims that at least his view of her changed. As the festival approaches, Hikari declares to Manaka that he has something important to tell her after it. #4 - Who Do These Feelings Belong To? 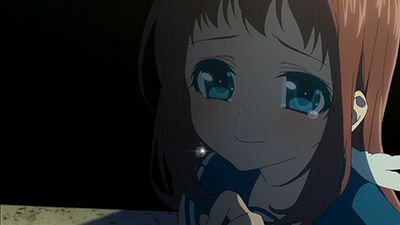 Still distraught with Uroko's revelations, Hikari is approached by Miuna who suggests him to confide what they just learned to the others, including Manaka, but he disagrees. After Miuna persuades him to at least reveal the truth to their friends, they gather them at Tsumugu's house. Kaname and Chisaki claim that Manaka's condition maybe could not be a bad thing at all, but Sayu lashes out at them for considering such thing. After their meeting, Sayu reveals to Miuna that she could only move on with her life thanks to her feelings for Kaname, unrequited or not, thus she could not agree at all with the idea of losing them. On their way back home, Hikari and Miuna meet Manaka and they find a white rock that according to them, is the same one produced by red-bellied seaslugs. Believing that the rock is a sign that Manaka's wish to the seaslug five years before was granted, Hikari gives it to her, although she can't remember what was her wish, and Hikari then realizes that such wish had something to do with her lost memories of love. In the next day, while making a pendant for Manaka using the rock, Miuna learns from Sayu that she intends to finally confess her feelings for Kaname. 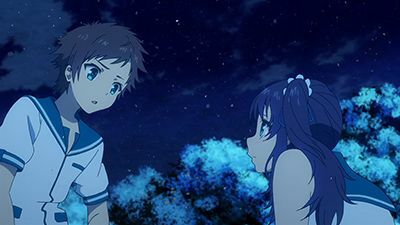 At the shore, certain that Manaka's feelings of love are for Tsumugu, Hikari asks him to hang out with her in order to have her lost memories and feelings return, but he refuses much to his anger, and when a passing by Chisaki watches Hikari attacking him because of it, she rushes to help. Tsumugu, efortlessly evading Hikari's attacks, reveals that he in fact loves Chisaki, who flees to the sea after hearing it, and when Tsumugu dives after her, his body also gains Ena just like Miuna's and the cursed fish at his arm swims out, guiding him to catch up to her at Shioshishio. In the occasion, Tsumugu reveals to Chisaki that he always liked her way before the day of the Ofunehiki five years earlier. Chisaki learns of Hikari's return but refrains from meeting him. Meanwhile, Hikari is still recovering from his hibernation when he meets some of his old friends and the fishermen association presents him with the same flag he used during the Ofunehiki. Still refusing to meet Hikari, Chisaki confesses to Tsumugu that she is afraid of how Hikari will react upon seeing her. However, Hikari dives into the sea and attempts to return to Shioshishio but the sea currents drive him away. Before he makes another attempt, Tsumugu appears and confronts him for not going to meet Chisaki and hears from him that he is too scared with how much things changed while he was asleep. While returning home, Hikari hears a song and learns that the song is played everyday for the residents of Shioshishio who are still asleep and following the sound, he encounters Chisaki and the two finally meet again. On the eve of the festival, Akira steals the pendant with Manaka's stone and accidentally drops it in the sea. 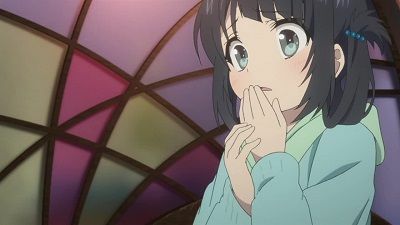 Miuna dives in to catch the pendant and has a glimpse of a conversation between Manaka and Tsumugu five years before, in which she confesses her feelings for Hikari. When asked by her about why he never told anyone about it, Tsumugu replies that he was doing so by Manaka's request. Later at night, Hikari is confronted by Miuna about his true feelings for Manaka and he confesses that he has always loved her, while Tsumugu, encouraged by Kaname, tries to get Chisaki to admit she has feelings for him, which she doesn't deny. The next day, the festival begins. Carrying the holy flame entrusted to them by Uroko, Hikari and his friends traverse the frozen sea until a storm comes, just like in the last Ofunehiki. Manaka falls in the sea but is unable to breathe underwater thanks to her lack of Ena. Miuna swims in after her and her own Ena transfers itself to Manaka. 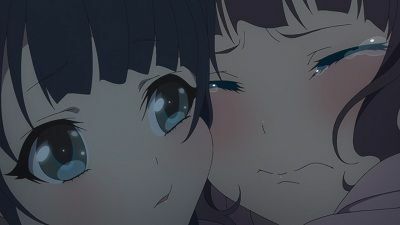 While watching this scene with Hikari and Chisaki, Tsumugu reveals to Hikari that Miuna and Manaka's Ena are connected because of their feelings for Hikari. Miuna then shoves Manaka away and dives deeper to become the Ojoshi herself and calm the water god. 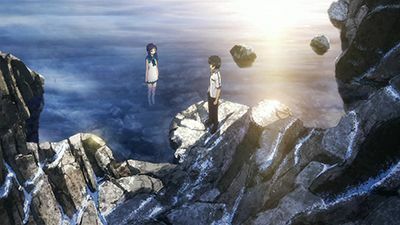 A desperate Hikari chases after Miuna in order to bring her back, but is stopped by a barrier which forms around her as she lays in the grave of the Ojoshi. Assisted by their friends, the children manage to rebuild the Ofunehiki. However, the real festival will not be held as the fishermen and the men from Shioshishio are at odds with each other. After helping the others to collect signatures for a petition to hold the festival again, Hikari fails to convince his father Tomori to comply but he ends up taking part in the reunion between both parts arranged by him. Despite being impressed at first with the Ofunehiki, it does not take long for both sides to reiginite their old feuds and start fighting, a situation that gets even more hectic when Akari and Itaru enter the room together. After the failed meeting, Tomori attempts to once again persuade her to break up with Itaru but she had made her decision and prepares herself to leave her house in Shioshishio. Hikari decides to leave with her as well but Uroko uses his powers in attempt to stop them until Tomori asks him to let them go. Still depressed with what happened, Chisaki does not join her friends on their way to school and when she finally leaves, she meets Tsumugu. Chisaki then confesses to Tsumugu that she likes Hikari unaware that Manaka, who returned to pick her up, was hearing them. Meanwhile, Akari breaks up for good with Itaru, claiming that she would never replace Miuna's mother in her heart. 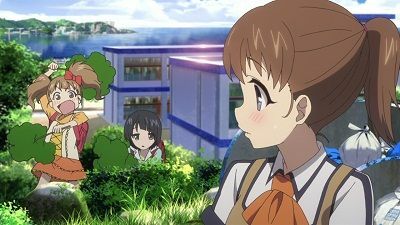 However, Akari learns later that Miuna diappeared and after warning Hikari about it, he and his friends manage to find her. Claiming to his sister that they will take care of her for the night, Hikari and co. have dinner with Miuna and after the others leave home, Miuna confesses to Hikari that she always liked Akari, but rejects her out of fear of one day losing her just like it happened with her mother and Hikari manages to cheer her up. In the next day, a worried Akari finds Hikari and Miuna sleeping peacefully beside each other and reconciles with her. As preparations are made for both the Ofunehiki and Akari's wedding, Tsumugu accompanies Manaka and Chisaki to the city to choose her wedding dress when Tsumugu has a brief encounter with his mother and he seems displeased upon seeing her. Meanwhile, Akari has a short meeting with her father and expresses her will to have with Itaru and Miuna the same happiness he provided to his children after his wife passed away. Back to Shioshishio, Hikari and his friends learn that those younger then them are already entering into hibernation and despite their efforts to delay the process, it is a question of time for the same to happen to them as well. Once reliving some of their memories from their old school, Kaname asks Hikari about his feelings for Manaka in front of the girls, and he finally confesses to her. A surprised Manaka runs away and Hikari chases after her, but Chisaki stops him for a while, and after confessing her feelings for him as well, she asks him to go after her. While running away from the village, Manaka ends up trapped again into Tsumugu's fishing net and she meets him. Five years later, the sea over Shioshishio is frozen and the surface enters into a continued winter. Chisaki pays a visit to Tsumugu's grandfather Isamu at the hospital before returning to meet Akari and her son, Akira. In the occasion, they reminisce about how Miuna cheered Akari up after she had found out that she was pregnant and was too worried about Hikari and the others to be happy with it. 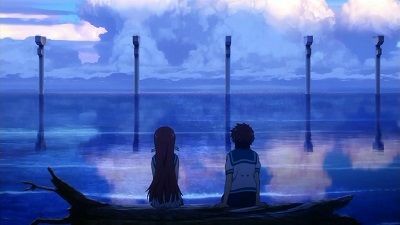 Meanwhile at the school, the students are informed that a Tomoebi will occur over the sea and they decide to have a party at the shore when Miuna is warned by Sayu that one of their classmates intends to confess to her in the occasion. 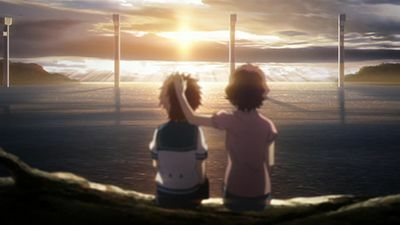 It is also revealed that after being shut out from home, Chisaki is taken in at Tsumugu's house by Isamu and they live together until Isamu gets hospitalized and Tsumugu leaves to study oceanography at the college in order to learn more about the situation at the sea villages and their connection with the climate changes at the rest of the world. 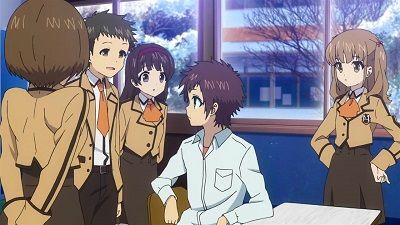 During the Tomoebi, Miuna is asked out by her friend, but she declines, claiming that she likes someone else, when a strange light appears and Tsumugu, who is studying the phenomena with his teacher, meets Miuna at the place where the light appeared and they find a naked Hikari, who did not get older at all since that day. Hikari and Akari move to Itaru's house and after dinner, Itaru reaffirms his intention to have Akari's father and the rest of Shioshishio acknowledge their union. Miuna asks Hikari to help her look for a present to Akari and he calls the rest of his friends to accompany them to the city. At the train station, they encounter Tsumugu who later leads them around the city. They check stores around the city for an affordable necklace for Akari. In one of the stores, Chisaki and Hikari get left behind since the elevator was full. Chisaki uses this moment to discuss with Hikari his feelings for Manaka. Hikari claims that if Manaka chooses to be with Tsumugu, he will respect that. 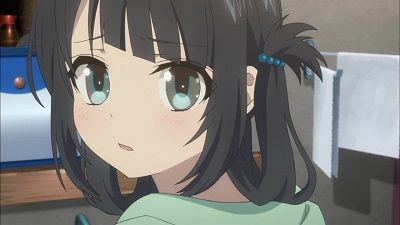 After choosing the present she intends to buy, Miuna asks her father for some extra money just to later discover that the necklace in question is sold out. Hikari and the ohters decides to help her search for some shells to craft a similar necklace instead. When Miuna finally gives the necklace to Akari, it starts snowing and Hikari recognizes that it is in fact saline snow, a phenomenon that supposedly only occurs underwater. With no signs of Manaka awakening, Hikari keeps searching for Uroko with Kaname and Chisaki's help with no success. 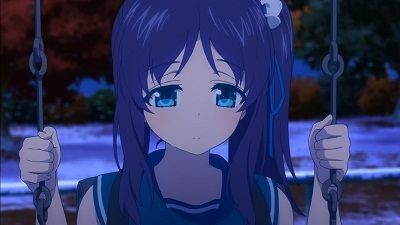 Miuna, who decided to not help with their search, is worried about Hikari and reprimands him when he reveals his intention to stop going to school while looking for a way to help Manaka, creating a divide between them. 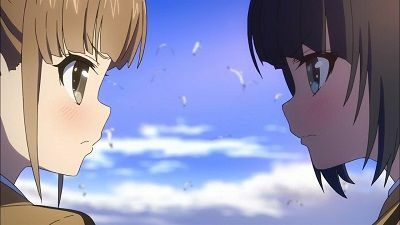 In the next day, while discussing with Sayu about it, Miuna starts wondering if deep inside she does not wish for Manaka to awaken out of her feelings for Hikari. Later at home, while mistaking Miuna for Manaka, a feverish Hikari collapses and in the next day, Miuna feigns to have a fever as well in order to stay at home and take care of him. In the occasion, Tsumugu calls her asking her help with his research, but realizing that she is crying, he rushes to meet her in person. In the occasion, Tsumugu reveals that just like her, he was afraid of Hikari and Kaname's return out of his feelings for Chisaki, but in the end, he got happy with their reunion. Wondering if she will have such feeling regarding Manaka, Miuna returns home, and while she has a serious discussion with Hikari, Manaka awakens to stop their fight, much to their shock and awe. As Akari is scolded by her father for disobeying the village's rules, Hikari reminisces about how she always took care of him after their mother's death, and is later informed by Akari that she decided to break up with her boyfriend. 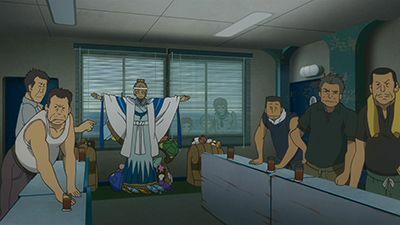 The next day, Hikari decides to confront the man and follows him up to Tsumugu's house where he is stopped by Tsumugu's grandfather, who explains to them that aside from the bad mood with the inhabitants of the surface, people from the village are not allowed to marry those from outside as their children will be born without ena. The children become unable to survive underwater and thus the former inhabitants are forced to leave Shioshishio to raise them. During so, Hikari discovers that Tsumugu's grandfather also came from the village. On the next day, Hikari stops being hostile to Tsumugu and he becomes friends with the rest of the group after they finally complete the Ofunehiki together. Knowing how much she is suffering with their separation, Hikari decides to make amends with Akari's boyfriend, but is stopped by the two girls who fought him before and one of them reveals that said man is her father. Manaka attempts to instigate another curse when her cursed fish departs to keep Tsumugu happy. Angry about Manaka's acts toward Tsumugu, Hikari verbally lashes out against her during school while Manaka attempts to balance her friendship with Hikari and her relationship with Tsumugu. Tsumugu, Manaka, Hikari, Chisaki, and Kaname all volunteer to make the offering for the Ofunehiki wherein they discuss Shioshishio and Tsumugu. As Manaka, Hikari, Chisaki, and Kaname leave for the day, they spot Akari kissing a man as she is dropped off at the pier. With relationships between sea people and land people on their mind, the four contemplate their individual concerns on the matter. The next day, Chisaki discovers Tsumugu is making a watering hole but wishes Tsumugu wasn't so nice. 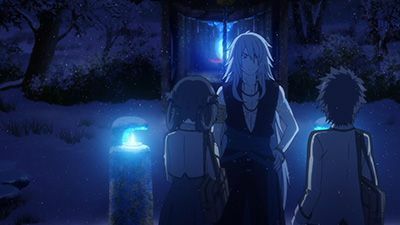 At Uroko's, Manaka begs to be cursed again being interrupted as elder men of the village dragged Akari to Uroko's place since due to her being involved with someone from the surface. 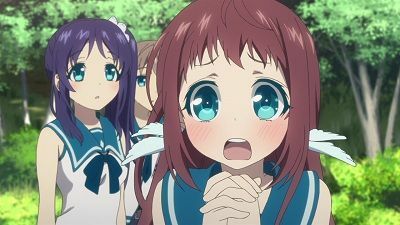 Hikari and Manaka can only watch on as Tomori takes Akari to Uroko. The adults of Shioshishio are assembled by Uroko who reveals that a catastrophe is coming. Meanwhile the students continue their preparations for the upcoming festival when Chisaki feels ill and Tsumugu takes her to the sea to restore her Ena. In the occasion, Tsumugu asks her if she has given up on Hikari and she decides to go home instead. Kaname accompanies her and they arrive at the village just to be recieved by the adults carrying blue lanterns. Manaka follows soon after and when she arrives home, she is infomed that from then on it is forbidden to return to the surface. In the next day Hikari learns that all of his friends from Shioshishio are abscent from school and he returns to the village to find out why. Manaka informs him that they are forbidden to leave the village as a calamity is impending and expresses her will to support him. Despite knowing that Manaka only views him as a friend, Hikari does not resist the urge to embrace her and he flees after a surprised Manaka shoves him away. Naked Kaname appears at the surface asking a man for information. Upon learning of Kaname's awakening, Hikari and the others reunite with him. After being examined, Kaname moves to Tsumugu's house and becomes unconfortable with how Chisaki and Tsumugu got closer. In the next day, Sayu, still having feelings for Kaname, is anxious about meeting him again, but when they meet by accident after school, she flees in tears when he fails to recognize her immediately. 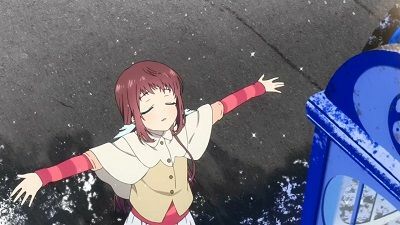 After overhearing Hikari talking with Kaname, claiming that he can't change anymore until he reunites with Manaka, Miuna has a fallout with Sayu, who decided to discard her feelings for Kaname for the sake of moving on with her life, but soon after, Sayu meets Kaname again and learns that he indeed recognizes her, much to her joy. Later that night, Hikari, Kaname and Miuna are informed that Tsumugu and Professor Mihashi found a weak point in the sea current surrounding Shioshishio, and in the next day, the three dive there in an attempt to return to the sea village, following the same sound Miuna heard when her Ena first activated. After some examination, it is confirmed that although still asleep, Manaka is in good health and should wake up soon. Watching Miuna next to Hikari while talking with the uncounscious Manaka, Chisaki realizes that Miuna also likes him as well. Some time later, while tending to Isamu, Chisaki hears from him a part of the Ofunehiki legend she never had heard before. Back at Tsumugu's house, Kaname questions him about what he intends to do with the data obtained regarding Miuna and the others and learns that he and his professor must show results tot he scientific community to ensure that their research on Shioshishio will keep being funded. 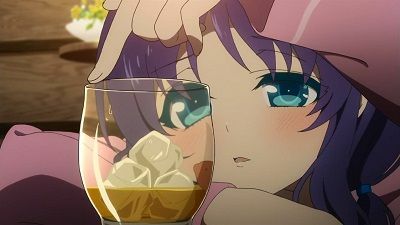 Later that night, Chisaki has some wine with Tsumugu and while she is asleep, both Tsumugu and Kaname express to each other their feelings for Chisaki. In the next day, Chisaki attempts to return to Shioshishio by herself but is dragged by the currents until Hikari appears to help. As they arrive at the village, Chisaki reveals to Hikari that according to Isamu, the young woman who offered herself to the Sea God could not forget the loved one she left behind at the surface and in the end, the god let her go, for a price. 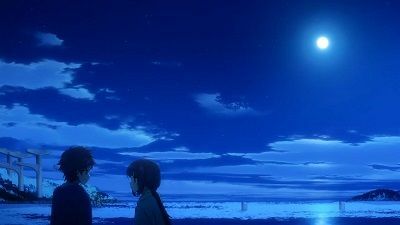 Certain that this must be related to Manaka having lost her Ena, Hikari decides to look for Uroko and confront him about it on a later occasion, and he leaves to return back to the surface with Chisaki, who realizes that she is still in love with him. However, one week passes, and Manaka is yet to awaken. After Kaname's confession, he and Chisaki accompany their friends to school as if nothing had happened. After their fast begins, the people of Shioshishio's Ena gets thicker in preparation for their hibernation, thus the children need to ressuply it with water more frequently while on surface. 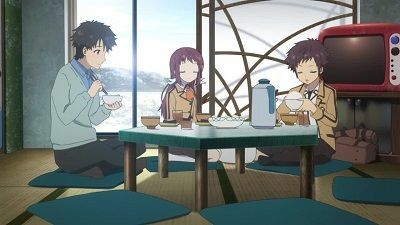 Fearing that they might never see their friends again after their sleep begins, Hikari and the others start eating again to delay the process. Meanwhile, Akari and Itaru make plans for their marriage while the fishermen asks Hikari to help them perform the Ofunehiki to please the Sea God and stop the cold. However, Iroko claims that their efforts at that point are futile but Hikari insists that they must do something. Assisted by the rest of the city, the children make their preparations for the ritual, but apparently it will happen in the same day the sea dwellers will start their hibernation. However, Akari asks the others to have her replace the offering, claiming that after pleasing the sea god she will return to marry Itaru with his blessing. After the others agree with her request, Chisaki, following Kaname's example decides to confess her feelings for Hikari as well. Hikari is informed that according to Uroko, the Sea God's power is weakening and thus the saltflake snow will keep falling and cooling the world until it freezes, possibly killing all humans in the surface in the process until his powers renew and the world is restored to its former self. To avoid this fate, the people undersea will enter into hibernation and the villagers will gather for a banquet on friday, entering into a fasting period after that until the hibernation begins. Believing that the only way to please the Sea God and prevent this catastrophe is to perform the Ofunehiki, Hikari convinces Uroko to let him and his friends go to school until the time for their hibernation and they revew their effort to make it happen. During the banquet, Manaka is distraught upon the current situation and when she finally finds a sea slug with a red belly, she makes a wish for it. In the next day, Kaname approaches Chisaki and confesses his feelings for her. Hikari and his friends start searching for Uroko without success. Meanwhile, the temperature arround the country starts dropping rapidly and it starts snowing even in the most remote areas and because of it, Professor Mihashi is called back to the university. Tsumugu decides to stay for a little more, claiming that he must countinue their research, but later reveals to Kaname that his true intent is to stay near Chisaki for a while. Meanwhile, Hikari realizes that Manaka had lost her memories from several situations they had experienced together, including the time when he confessed his feelings to her. Some time later, Hikari and Miuna finally meet Uroko at a nearby shrine and he explains to them that just as they suspected, Manaka had become an Ojoshi for the Sea God herself, and it helped delay the cooling of the planet, which started accelerating again when she was taken back to the surface. He also reveals that just like Manaka, the original Ojoshi could not discard her feelings for the loved one she left behind and the Sea God allowed her to return, but it took away her memories of love instead. A desperate Hikari then realizes that at her current state, his feelings for Manaka will never reach her at all. 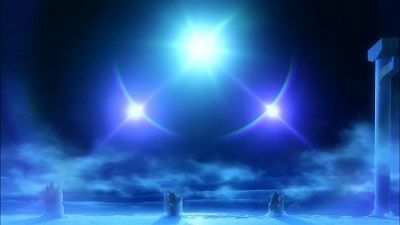 By following Miuna's directions, the three finally arrive at Shioshishio, now covered in snow and with its residents still asleep. Anxious about meeting Manaka once more, Hikari decides to return home and pay a visit to his father first, while Kaname leaves to check on his house as well. While waiting for them to return, Miuna hears the sound once more and is guided to the sea children's old school, where he sees glimpses of how Hikari and the others' days there used to be. Soon after, Uroko appears before her, questioning the girl if looking for Manaka is what she truly wants, disappearing after Kaname and Hikari appear looking for her. Miuna then hears the sound again and they follow it to a secret, unknown trench where all the previous Ojoshis are deposited, where they find Manaka, who is still asleep. However, Miuna realizes that the sound is coming from Manaka's Ena, which is coming off, putting her life at risk, and Hikari decides to take her to the surface. The whole place colapses as the three leave Shioshishio taking the unconscious Manaka with them. Hikari goes back to school with Miuna and Sayu. 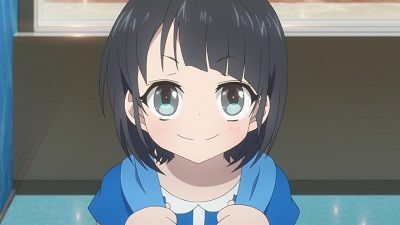 The next day, while Akira has rubella, Sayu accompanies Miuna and Hikari to the city to choose Hikari's school uniform when Miuna and Sayu have a discussion where Sayu admits to be jealous that good things only happen to Miuna. The two girls separate and Hikari, after attending at the end of the argument, decides to stay with Sayu. He and Shun are driving Sayu home when Hikari stops the car and go to the place where he is sure to find Miuna, which is the same place where he saved her five years ago. He finds Miuna and after a boom dolly collapse just in front of the two, Miuna falls into the water. Surprisingly, Miuna ends up breathing under water and swims looking at the bottom of the sea, until she sees Hikari swimming towards her. When they are out of the water, Miuna meets Sayu who was worried and apologizes to her. That day Kaname wakes up. The children are taking swim classes and the boys get hyped upon Chisaki's body. Hikari and Tsumugu decide to have a small competition but Hikari ends up crushing his toenail and Manaka rushes in quickly to assist him, leaving Chisaki once again ashamed as once again Manaka stood up to him ahead of her, to the point of refusing to help taking him to the infirmary and Hikari gets frustrated not only for hurting himself, but for realizing that Tsumugu can swim faster than him at the surface. After classes, the children join togerther to rebuild the Ofunehiki, joined later by Miuna, Sayu and hte rest of the class. However, Chisaki leaves earlier and Manaka fails to cheer her up, as she is still troubled by her feelings. On her way back home, Manaka meets Tsumugu and reminisces about the day when she and her friends failed to witness the Tomoebi, a rare underwater natural phenomenon because it took to long for her to join them. Back at Shioshishio, Manaka witness the Tomoebi starting again and manages to call Chisaki to watch it with her, and taking Tsumugu's advice, she speaks her mind without hesitating to reconcile with her, but regretting that they could not watch it together with the boys, unaware that Hikari and Kaname are watching it too while overhearing them. Miuna and her friend Sayu ask Hikari to come up with a plan to break apart Akari and her father Itaru for good but he declines, claiming that he despises underhand schemes. 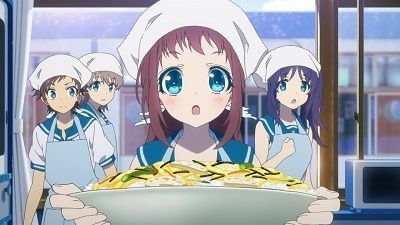 In home economics class, Manaka decides to have some of her classmates taste the dish she made with her friends in an attempt to befriend them too, but they shove her away dropping it on the ground and cause a commotion in class. The boys refuse to apologize and when Hikari learns that someone destroyed the Ofunehiki, he blames them for it while the real culprit, Sayu confesses that she did it to get back at Hikari for refusing to help them. 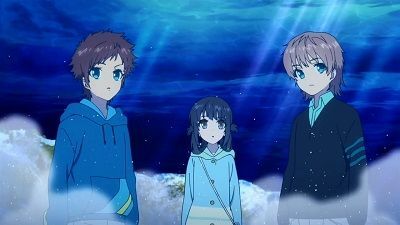 Remembering Hikari's words Miuna reprimands her friend for it and while returning home, Hikari and Manaka rescue Itaru from drowning after he borrowed some diving gear to see Akari at the village and they discover that Miuna's deceased mother was from Shioshishio. Meanwhile, Akari reveals to Uroko that she was friends with Miuna and her family and after her mother died, she decided to take care of her and her father in her place, but with Miuna's rejection, she decided to give up on it. After learning from Sayu that she was the one who destroyed the Ofunehiki, Hikari apologizes to the boys that he wrongly accused and Manaka stands up for him, which makes Chisaki sad as once again Manaka helps Hikari while she could do nothing for him. Hikari and his friends are surprised with Manaka, who, just woken up, acting as if nothing changed, without a single Ena remains on her. Meanwhile Miuna, who left her home earlier, accompanied by Sayu is soaking her feet in the water at school since she mysteriously got Ena and feels hard at breathing just like sea people. Sayu asked her if Miuna isn't happy with Manaka woken up. Miuna stated she is happy but she feels somewhat different than she imagined. While Manaka is playing with salt flake snow with Chisaki, Hikari and Kaname discuss about how Manaka stay the same. Kaname says it probably because her friends are there for her, and because of Hikari himself. Hikari stated that Manaka doesn't remember about what happened before she went hibernating but does remember some voice called out of her, not sure if they're telling her to "giving something" or "she'll given something". They later go to school rooftop and meet Miuna and Sayu, discussing about study. Chisaki feels left out since she's the only one who already went through it, goes to hospital and meets Tsumugu and his grandfather. At hospital, Tsumugu says he'll back to city at the end of the month. He promised he will come as soon as he can, calling, and always giving Chisaki a news immadiately. Chisaki jumps to a conclusion that Tsumugu is lonely, while Tsumugu worries about Chisaki being left out and lonely. Chisaki says she fine since her friends are all there and she will busy with Manaka. Hikari and Miuna's family have dinner and invite Sayu, Kaname, and Manaka; Chisaki and Tsumugu, however, declined the invitation. 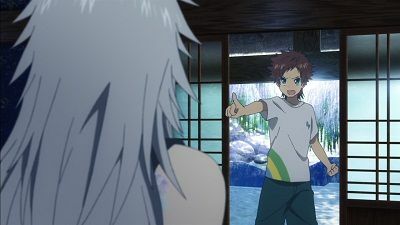 Early next morning, Tsumugu runs over to Hikari's home and reveals a live fishhead protruding from his left arm-similar to that on Manaka's knee in the first episode-and reveals that Uroko must have cursed him. Hikari gleefully takes this to mean that Uroko must be nearby.